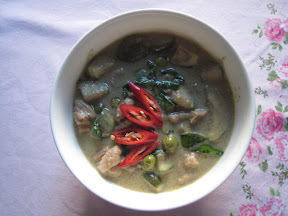 Small eggplant optional Solanum Torvum Sw.
Gently heat the pot, add the oil and the curry paste fry them with low heat until mix well and smell nice, add chicken meat to fry for a few minute, if the mixture is too dry add 1tablespoon of coconut milk. 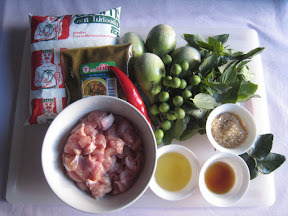 Fry the mixture for a few minute then season with fish sauce and sugar, and then add the rest of the coconut milk. When boil add sliced eggplant, stir them well, so that the paste doesn’t stick to the bottom of the pot, reduce the heat and let all the ingredients cook 20 minutes or until the eggplant is cooked. Add the basil and lime leave, stir them in and done. The Chili could be added now or on serving.